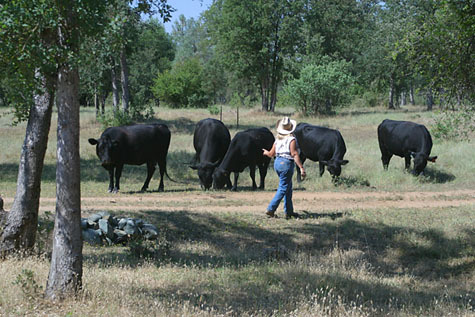 Ranchers from Nevada, Yuba, Placer, Sierra, Plumas and El Dorado Counties established High Sierra Beef, Inc. in July 2004. Our mission is to provide a distinctive, high-quality, and safe grass-fed and finished product. Our cattle never receive grain, growth hormones or fed antibiotics. Grass-fed and finished beef is a healthy alternative, with less saturated fat and more beneficial omega-3 fatty acids. Our animals spend their entire lives on open pasture. Their grazing benefits the land and improves wildlife habitat. As long as the rancher practices controlled grazing, it is a sustainable, solar-powered system for producing food on rangeland. According to an old saying, "You can tell what kind of a stockman a person is by looking at the behavior of his cows. Cattle have long memories. Animals that are handled gently and have become use to handling routines will experience less stress when handled. This type of sound management relates to more optimum weight gains and meat quality."